Wow, what a great weekend of flyfishing! I had the privilege of guiding my old client Howard MIller of Dallas, who came down with his daughter Becky for two days on the water. It had been a couple of years since Howard had been down, and he hadn't flyfished since. He had rescheduled twice due to the tropical systems that had brought a deluge of rain and high tides. But when we headed out on Friday morning, the Arroyo was no longer draining, and the bay was as beautiful as I've ever seen it. The tides were high, but they always are from Labor Day until early December. The reds push farther back into remote westside venues, and once they get established, they tail in pods day after day, feeding on white shrimp and crabs. 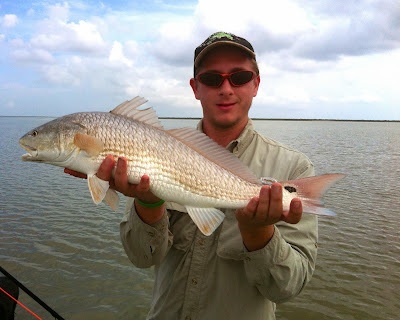 The larger reds will also cruise the shorelines of the far westside lagoons blowing up on finger mullet. It's the best time of the year. I elected not to go into my oft-favorite lagoon in favor of heading farther south in hopes of finding pods of tailing reds. I regretted my decision on the way, sure that I'd effed up and would have to backtrack later. But we shut down in an expanse of glassy foot-deep water without another boat in sight, and it was hard to fault the decision to be there. Indeed, as we poled further and further west, we began encountering small pods of reds tailing almost imperceptibly in the glassy water. We crossed a threshold that normally stops most skiffs, but the Stilt kept floating. We entered a place that rarely sees a boat. It became clear that the reds had taken refuge there, because the dark tips of their tails began appearing in the early morning light, until we were literally surrounded by pods of tailing fish. A single skiff appeared a half a mile to the east. We had it to ourselves. For about two hours, we poled from one pod to the next. The day proved to be an "adjustment" day for Howard, and only a few fish were landed. The next day, however, we left the dock earlier in order to take advantage of the tailing action. It was twilight when we arrived at the shallow lagoon. Immediately, tails popped up all around us. For the next three hours, we enjoyed some of the best action I've seen in years. Howard landed eight reds on a light chartreuse and white Clouser, all between 24 and 26 inches. The wind came up mid-morning, so we ran around looking for visible fish, finally returning to my favorite early morning venue. Usually, the reds leave this area by late morning, but in the fall, the water depth is sufficient enough that even during an outgoing tide, enough water remains to support feeding fish. It was critically shallow, and I am sure we poled through water that only a Stilt could negotiate. Wow, it was full of reds feeding singly and in small roaming pods that were exploding on whatever got in their way. We poled about three hundred yards, and had about 15 good shots. Then we looped back upwind, and poled through the same area, only to have at least as many shots at big reds. Howard was really happy that he'd chosen to wait for good weather. As we said goodbye, I urged him to return soon. He's 83, and I'm 62. I said, "come soon, because I don't know how long I will be guiding." He laughed and said, "You and I will hire a guide, then." It's a strange feeling when I say goodbye to some of my older clients, with whom I have had such good experiences over the past 15 years. We really don't know each other, except on the deck of a skiff. But somehow we learn most of the important things you can know about a person---how they deal with challenges, disappointments, and what role patience plays in their lives. It's a soulful exchange, much more about life than just catching fish. As Sparse Gray Hackle once said, "Sometimes I think the least important thing about fishing is catching fish." I've been using the voice-to-text program Dragon dictate, and it's barely worth it, given the mess it creates. So if you find that my prose in my last post resembled the incoherent muttering of a recently awakened baboon, please forgive me. I have corrected most of it, and will endeavor to check it before publishing next time. For the past month, we have experienced almost continual rain and clouds due to three separate tropical depressions. This time of year, most hurricanes that begin in the Atlantic do not reach us. However, the storms that spring up in the Caribbean or especially in the Bay of Campeche, which is just above the Yucatán Peninsula, can catch us almost unawares. Indeed only 40 years ago when my father would fish the Mexican beach south of the border, storms would come up quickly and surprise anglers were camping and fishing the surf. On one occasion, my dad was camping with several friends in a large tent about 100 yards from the edge of the water, when they were suddenly awakened in the middle of the night by a large wave that hit the tent and flooded the interior. They jumped into their four-wheel drive vehicle and drove it as far as they could up into the dunes where they spent the next six hours or so weathering hurricane force winds. That was back before we had the luxury of satellite coverage of approaching hurricanes. In addition to the immediate wind and rain from a tropical system, we also experience a significant surge in title levels whether the storm reaches us not. Indeed, a storm that reaches the Gulf even as far east as the Florida peninsula will nonetheless push water westward until we experience a significant bump in the normal tides. So, the usual stable weather of late summer can turn into constant rain and wind and high tides, which of course ruins the fishing. But this last weekend, my son Ryan and I went out fishing in order to scout the situation prior to several charters that I have in October and beyond. We found the bay in its pristine condition, having returned to its seasonal title levels, which are still quite high, but nonetheless fishable. We fished in only two venues, and found reds in both places. Ryan who has just moved back from Virginia, and is excited to be flyfishing again, did quite well on his first outing out. In fact, he caught more reds than I did! We found tailing reds in a westside lagoon that was also festooned with tailing Sheepshead. Interestingly, the sheepshead were quite willing to take a fly. I hooked two big ones there, and landed one. Meanwhile, Ryan landed a very fine red, which he released before I could photograph it. We headed further north into another Westside lagoon that fishes well in sunny conditions. The big reds were feeding on baitfish along a grass free shoreline, chasing bait into the shallowest water. The reds would appear with their backs on the water, giving us breathtaking opportunities to cast a big fish in very, very skinny conditions. I headed in one direction, and suggested that Ryan go in the other direction due to the wind and the fact that he was right-handed. The area that I fished was full of big reds met were feeding explosively, but disappearing just as soon as they would strike. I found it hard to see them, and to cast to them. Ryan, on the other hand, headed in a direction where the water was clearer and even shallower. They were there with their backs out of the water, and Ryan had almost constant action until he landed a 27-inch red. Not wanting to be left out of the action, I headed over to join him and waded parallel to him, fishing even shallower water up against the shoreline. The reds were still there feeding aggressively an almost impossibly shallow conditions. We didn't catch a lot of fish, but the ones we caught were big ones. The wind and clouds came up in the late morning, so we decided to pack it in. This weekend, I guide my old client Howard Miller from Dallas, who has rescheduled three times in the last six weeks due to weather. The forecast says that he should have ideal conditions. Beyond Howard's weekend charter, I have several others lined up, and I hope that the tropical storms have finally run their course. We really needed the rain, and we got plenty of it. But now, it's time to catch a few fish.